"She really is lovely and it will take lots of time to bring her around, so don't be worried if she needs time to learn to trust her new home, new stall, new pasture friends .... it is something she has probably learned NOT to trust....give her all the time she needs - sit with her and don't always touch her..... sit and read a book near her but not looking or touching her ....you want her to come begging for your interaction - makes them trust faster. Learning to trust again is huge - coming for food is survival - coming for love, touch and connection is emotional - much different and remember their brains are different - trust should not be confused with natural instinct to survive. I often bring my chair within reach and sit quietly doing my Ipad work but not connecting - they come to me to say HEY - you are ignoring me .... they come to me because they want to - rather than letting me be all over them because I can. Touch is emotional not rational ... we have to earn it . That is how to really bond and gain trust. Then if she is and can get healthy again - she will recover faster... We always need to remember the psyche is different with a horse than we think it is." So I told her I was going to go sit on the swing near the picnic table and that I would be there if she wanted me. I watched her for a long time as she grazed and very occasionally looked up at me. After about 20 minutes, she picked up her head and slowly sauntered over. By that time I was sitting at the picnic table, and I just watched hear and waited (resisting the urge to meet her half way). 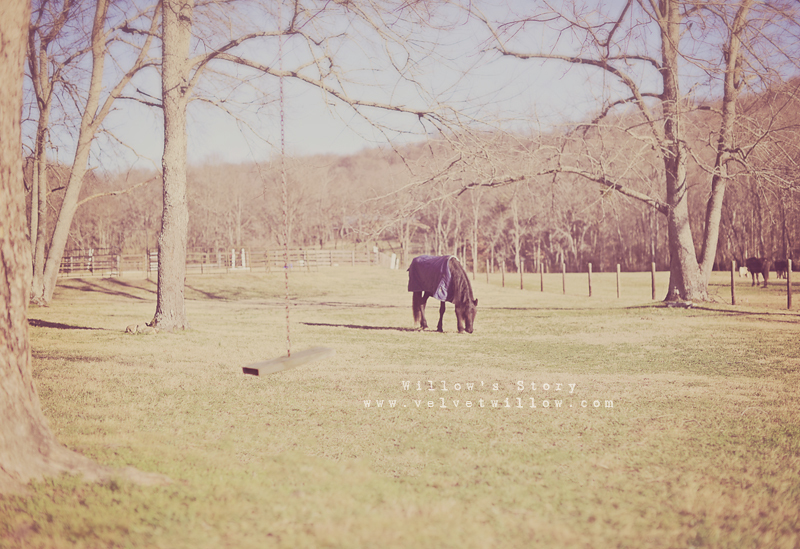 When she got very close, she looked at me, glanced at the swing, and then looked at the barn and slowly walked past me toward the open barn doors. I got up and followed her, as I felt she wanted me to. Shen she got to the breezeway, I was still behind her but I could hear Martha cleaning the barn floors with the blower. 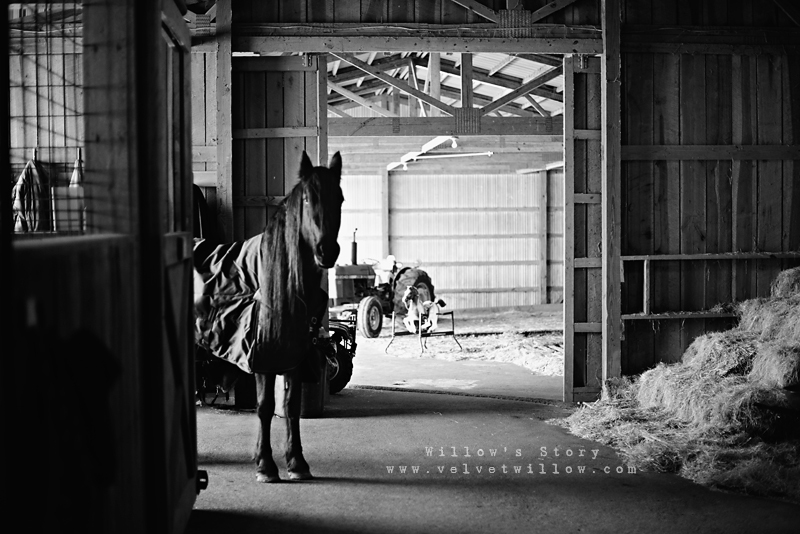 It was very loud, but Willow didn't spook... she just stood there looking down the breezeway toward her stall, as if she was waiting for Martha to turn off the noisy blower. I walked past Willow, and opened her stall door. Still, she stood there (Martha was not going to turn off that blower- I could tell - even though Willow and I both wished she would). So I took a couple photos of her and then walked inside her stall to show her it was okay. When I walked back out, she was already on her way toward me... and she walked right into her stall. 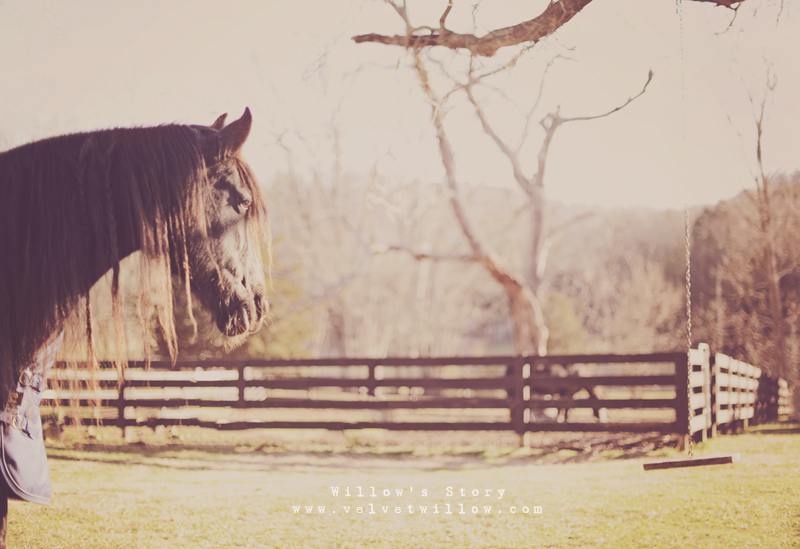 Willow is a beautiful horse and you are a beautiful person for caring for her as you do. She´s so beautiful! I love learning how their mind works. I'm learning so much from your experience! And I's so glad that she's doing well! I love the way you communicated with each other, just quietly listening to her with your heart and following her cues. In a way it reminded me of my first few days in China with a terrified, confused little girl. She couldn't understand my words, telling her it was going to be okay, so I had to listen to my instincts and show her, day by day. Show her that she was safe, she was home, and she was loved. Watching a broken heart mending itself little by little is such a sublime gift! Oh Jennifer, your comment made me cry! Yes, there are so many parallels with this and the adoption experience for me.... many good (China), but many sad as well (Guatemala)... I am debating whether or not to write about those- perhaps it will be healing for me. Again, thank you for your comment.. beautifully expressed and oh so true! what a beautiful heart you have. I've just read through all of the posts about Willow, at first I couldn't type, couldn't see through my weeping. What a wonderful thing you have done to save Willow. 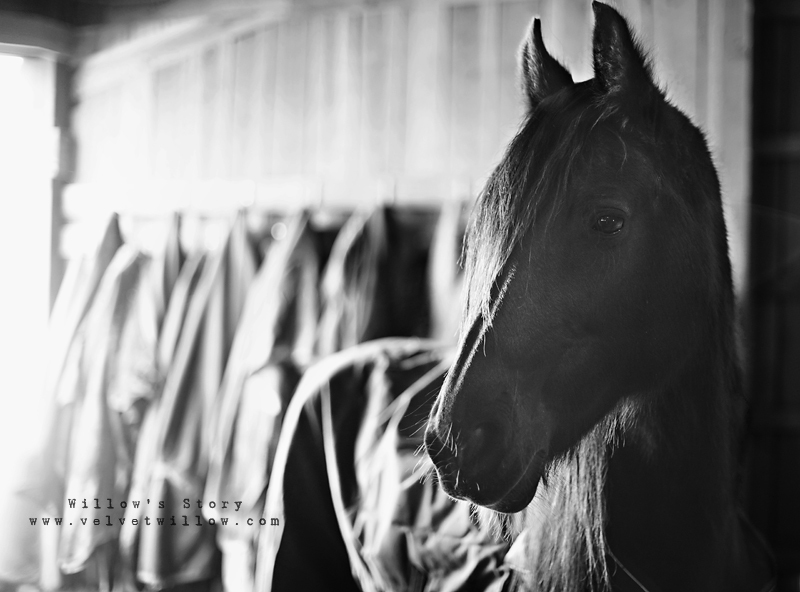 I grew up on a horse farm in Vermont so this story has really touched me. I will be anxiously following along! She is such a beautiful horse, I can't wait to watch her photos change. Thank you so much for sharing this with us.